The third refresh of the Xbase++ 2.0 <CXP/> CTP1 delivers various fixes, new samples, refactored classes and a partial class documentation of theexecution infrastructure. This release is provided as a zip file containing two installation packages. Choose cxpctp1_iis7.msi to install the <CXP/> technology for the IIS7 web server, or choose the installation package cxpctp1_apache.msi if you are using a Apache 2.2 web server. Note: The README included in the zip file contains further details about the changes applied to the <CXP/> infrastructure, especially the changes in member variable and method names. The README also provides important information about the <CXP/> installation process. Refresh 2 of the <CXP/> CTP1 just went online. Most importantly, the 2nd refresh of the <CXP/> Community Technology Preview (CTP) does include an installation package capable of configuring the Apache 2.2 web server for usage with <CXP/>. This refresh replaces any previous installation packages, hence make sure that you have deinstalled any older <CXP/> CTP1 installation before starting the installation of <CXP/> CTP1 Refresh 2. This release is provided as a zip file containing two installation packages. Choose cxpctp1_iis7.msi to install the <CXP/> technology for the IIS7 web server, or choose the installation package cxpctp1_apache.msi if you are using a Apache 2.2 web server. The README included in the zip file contains further details about installing the <CXP/> infrastructure. NOTE APACHE USERS: Please consult the README file to learn if additional steps need to be performed when installing <CXP/> in your Apache setup scenario! 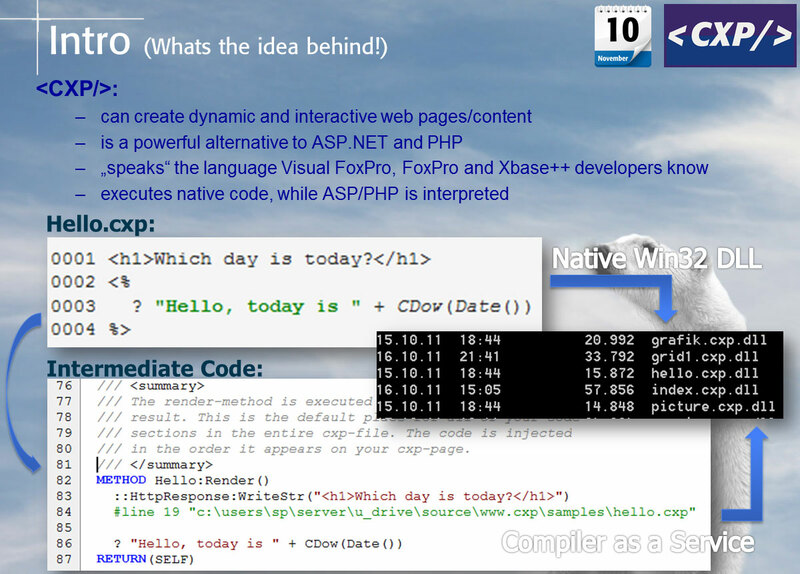 For developers who are still wondering what <CXP/> is all about, or who cannot get an idea about the features included due to the omitted documentation, we have created a PDF document from an introductionary talk about this exciting new technology. You can find the English version here , and the German version here ! <CXP/> is the first Community Technology Preview (CTP) in the context of our efforts towards Xbase++ 2.0. This technology allows all Xbase++ and Visual FoxPro developers to effectively utilize their existing experience and knowledge for writing modern Web and Connected Mobile applications for iPhone, iPad, Android and other platforms. Download: Existing customers can go straight to www.alaska-software.com -> login -> downloads -> previews, and download the first CTP. Non-Alaska Software customers and Visual FoxPro developers first need to create an account to access the download area. After having completed our server maintenance, all downloadable software and other content, such as whitepapers etc, are now merely accessible and downloadable via your personalized user account, which you can access using the Login button on our homepage. The usage of our hitherto Electronical Software Delivery System (ESD) has been discontinued. Hence the credentials you have received and used for the ESD download are no longer valid. Furthermore, we would like to point out to you that the entire new download management as well as all of the user account management features are completely driven by the <CXP:Technology/>, which is currently available as Community Technology Preview (CTP). <CXP/> is the latest technology spin-off derived from our development efforts towards Xbase++ 2.0. The <CXP/> technology allows all Xbase++, Clipper, FoxPro and Visual FoxPro developers to effectively write modern Web and Connected Mobile applications using existing experience and knowledge, hence giving access to a large variety of form factors and devices. Use Xbase++ with the <CXP:Technology/> to add value to your existing Visual FoxPro, FoxPro or Clipper solution. Write web or Connected mobile applications which even can transparently access your existing dbf/ntx, dbf/cdx files. This CTP concentrates solely on the <CXP:Technology/>, the new build and execution infrastructure for Web and Connected Mobile application, development and hosting. More details about the <CXP:Technology/> can be found here. Developers who do not have the time to participate in the CTPs but still want to start using these great technologies coming with Xbase++ 2.0 should consider attending the forthcoming 4th European Xbase++ DevCon taking place in the Hannover Area in April 2012. There, you will get in-depth knowledge about the <CXP:Technology/>, its use cases and how your clients can profit from it. 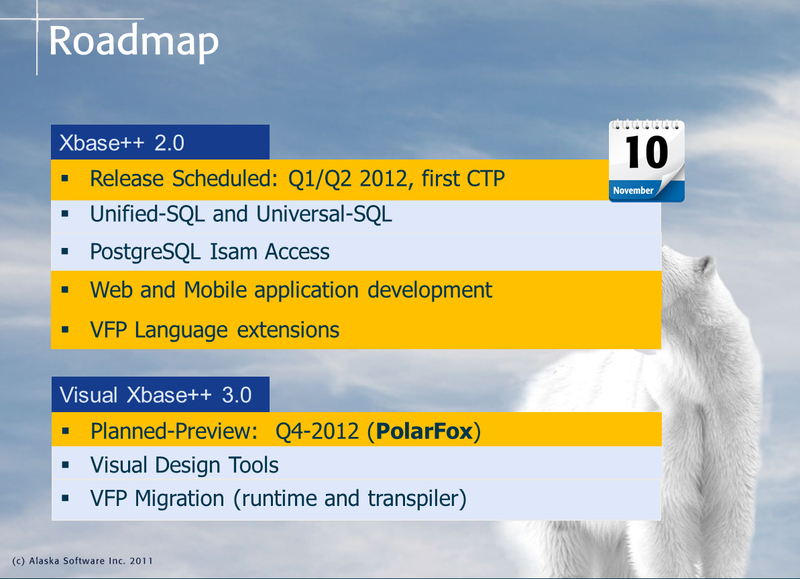 The roadmap and featureset of Xbase++ 2.0 have been extended to cover Web and Connected Mobile application development, but also to enable Visual FoxPro developers to jump start with Xbase++ now. The latter is achieved with new commands and datatypes which not only increase Visual FoxPro compatibility, but also boost Xbase++ developers' productivity. This Community Technology Preview (CTP) starts on Nov. 10th, 2011 , and concentrates solely on the <CXP:Technology/>, the new build and execution infrastructure for Web and Connected Mobile application development and hosting. More details and download instructions will be announced on Nov. 10th, 2011. Of course, there is much more coming in Xbase++ 2.0 and the forthcoming CTPs! It is therefore a good idea to sign up now for the 4th European Xbase++ DevCon . Furthermore, you can even save some money profiting from the early-bird discount. The conference takes place in the Hannover area in April 2012 . Be there and you will get for sure the best jump start into the featureset of Xbase++ 2.0, which touches on topics ranging from using the latest SQL technologies to Web and Connected Mobile application development. Just like in the last couple of years, Alaska Software will participate in various developer conferences, starting to this fall. However, one thing is different to the last years. We haven't provided any details about the concrete session content yet! Wondering why? Well, with respect to the current uncertainty in the Windows ecosystem with major vendors such as Telerik*)preparing for a HTML5/JS UI and DevExpress*), putting their WPF/Sliverlight efforts on hold we know there will be a major shift ahead of us. Nevertheless, rest assured! Alaska Software is prepared to deliver value to its customers fitting into the world of tomorrow. More details about the specific session content will be released as soon as possible. This is true for the forthcoming Polarfox related sessions in Oct. and Nov. at the VFP-Conferences in Phoenix/Arizona and Frankfurt, as well as those sessions to be held at the 4th European Xbase++ DevCon, which will take place in the Hannover Area in April 2012. So, check out all the web-sites , and get registered today! *)Telerik and DevExpress are one of the major component and framework vendors for the Windows platform. Together they serve hundreds of thousands if not millions of mission ciritical application developers worldwide. The third Xbase Part Pack is available for download. It comes with a total of five UI components. Two of them, the XbpFolderPicker and XbpRowPickBrowse are designable with the Xbase++ FormDesigner. As the name suggests, the XbpFolderPicker allows easy selection of a folder. The XbpRowPickBrowse is a custom browser class which allows to mark ("pick") any number of rows from the data displayed in the browse. Also included is a custom column class (XbpGradientColumn) for displaying numerical values as a percentage value in relation to a given minimum and maximum. As always, all Parts come with full source code and therefore can be used as a building block to develop your own visual components in Xbase++ for Xbase++. To get access, please go to www.alaska-software.com, log on to your customer account, then go to download -> solutions. Note that an updated version of the Xbase++ form designer is required for using this Xbase Part Pack. This version is contained in Hotfix Rollup #44 and must be installed on your computer. Xbase Part Pack #3, sample showing folder selection dialog and browser classes. Remember: Xbase Part Packs are for active Subscription customers or customers who have purchased Xbase++ in the last 12 month only. Xbase++ 1.90 Service Level #1 with new features is a precondition for using this Xbase Part Pack. We are pleased to be able to invite all of our Xbase++ developers living in the greater and/or metropolitan area of Vienna to attend the set-up meeting for the newly-to-be established XUG Vienna. An Alaska Software representative will be present as well. Please consult our Events Section for the details of this upcoming event. First of all the good news: as of yesterday, our www, DNS, web application and email infrastructure is back online! Right now, we are fighting to catch up with order, support and of course, pre-sales backlogs, which for sure will take us the rest of the week. We would like to apologize for the inconvenience and shock this "Alaska Software Internet blackout" has created for our customers. For those of you interested in an account of the events from a technical point of view, we would like to point out the following article in our newsgroup: click me . This Saturday, April 30th, 2011, our Chief Technical Officer and Architect of Xbase++, Steffen F. Pirsig will present a sneak preview of Xbase++ 2.0 alias Arctia! The sneak-preview will be held at the yearly member meeting of the Deutschsprachige Xbase-Entwickler e.V. in Hannover. For details of the event and how to attend, check out our events section !